Blinded by greed for property worth lakhs of rupees, a middle-aged woman of Chakkar village allegedly hired contract killers to get her NRI father murdered. The district Health Department today identified 35 more cases of gastroenteritis in Makkar Colony which is reeling under the grip of this disease for the past few days. With so many fresh cases reported today, total numbers of patients has touched 200-mark. 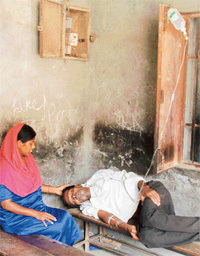 A gastro patient being administered intravenous fluids in Makkar Colony on Monday. The meeting of the General House of the MC scheduled for tomorrow would be stormy if claims of BJP and SAD councillors are to be believed, who are all set to demand the tabling of last meeting’s agenda. The Punjab Urban Development and Planning Authority (PUDA) has issued notices to residents of PUDA colonies to raze the encroachments on road berms in front of the houses within a month. The Shiromani Akali Dal (Amritsar) has expressed grief at the demise of Simon Wiesenthal, the Nazi hunter, who died yesterday in Vienna at the ripe age of 96 years. 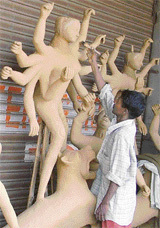 in the trade unions’ strike on September 29. Thirtytwo bodies of government teachers, under the banner of the Anti-Privatisation Front, which has been formed for fighting privatisation policies of the government, held a meeting here today and decided to support the strike call given by all trade unions across the country on September 29. Senior Punjab Police officials, shocked over the demise of the ADGP, Dr P.M. Dass, in an avalanche, have termed it as an irreparable loss. Mr Mohamad Mustafa, IGP, said: Dr Dass had high regard for those who made the supreme sacrifice while combating militancy. The fort that Maharaja Ranjit Singh built on the bank of the Sutlej at Phillaur now houses the Maharaja Ranjit Singh Punjab Police Academy. Some years ago, Dr A.A. Siddiqui, who later served the state as the Director- General of Police, organised a seminar on Sufi studies at Phillaur when he was the Principal of the academy. 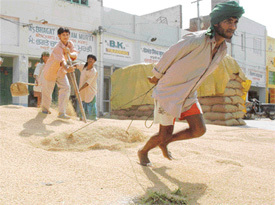 Apprehending a spillover of the controversy over relief distribution in Haryana after the Gohana incident, the Punjab police has directed SHOs of all police stations to keep a watch over the situation in their respective areas. 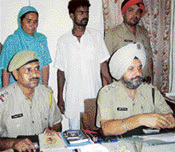 The Sudhar police has booked three brothers, including the sarpanch of Nangal Khurad village, under Sections 323, 324, 325, 341, 506 and 34 of the IPC for allegedly assaulting their political opponent, who had contested civic body election against the sarpanch. The Vigilance Bureau today claimed to have busted a scandal relating to the violation of building bylaws with the arrest of two city businessmen. The CIA-I wing of the city police today claimed to have busted a gang running a fake currency racket in the city. The salient features of fringe benefit tax like basis of charge, procedures for filing of returns, assessment and applicability of other provisions of the Income Tax Act were highlighted by Mr R.N. Lakhotia, tax investment consultant, at a seminar organised by the CII Ludhiana Zonal Council here today. At a meeting of the United Cycle and Parts Manufacturers Association, the ruling Pahwa group announced its candidates for the association’s forthcoming elections. 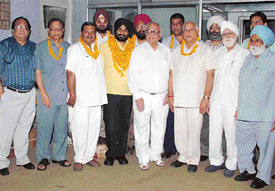 Industrialist Charanjit Singh Vishwakarma was chosen as candidate for the post of president. National Integration Camp, in collaboration with Union Ministry of Youth Affairs and Sports, at Master Tara Singh Memorial College for Women has entered its third day today. A 12-member foreign delegation from Eastern University, Sri Lanka, is on a 10-day trip to PCTE. Dr K.S. Aulakh, Vice-Chancellor, Punjab Agricultural University, today clarified in a press note that the two employees of the PAU who broke their indefinite fast had done so unconditionally after agreeing to submit their replies to the show-cause notices issued to them earlier. In the boys’ junior section of the Ludhiana District Volleyball Tournament, A S Senior Secondary School, Khanna, fielded two teams and both teams won their matches to advance into the last four stage. 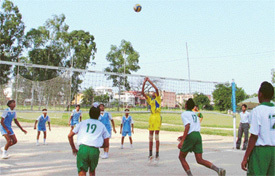 A match between A S Senior School, Khanna, and Harsh Vidya Mandir Day Boarding School in progress on the first day of the Ludhiana District Volleyball Championship on Monday. — Photo by I. V.
2-0, Ludhiana b Amritsar 2-0; (girls u-17) Ludhiana b Amritsar 2-1 and Ropar b Jalandhar 2-0. Patel House XI and Raman House XI were declared joint winners in the inter-house cricket tournament organised at Kundan Vidya Mandir Senior Secondary School, Civil Lines, here today. In the final, both teams had a tie at 150 runs.